2003-04-02 Assigned to KIMBERLY-CLARK WORLDWIDE, INC. reassignment KIMBERLY-CLARK WORLDWIDE, INC. ASSIGNMENT OF ASSIGNORS INTEREST (SEE DOCUMENT FOR DETAILS). 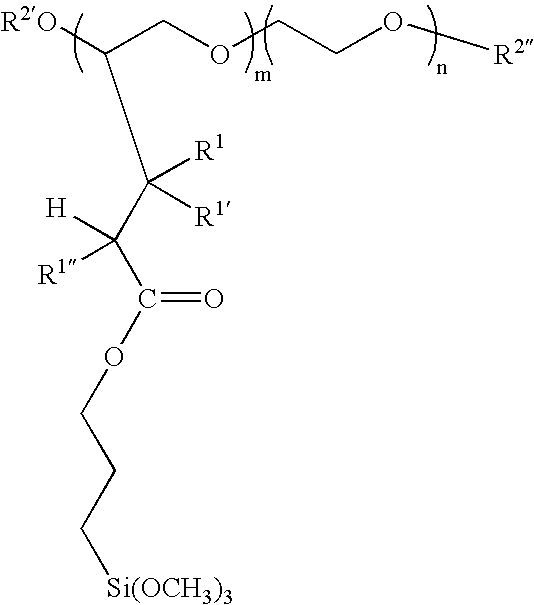 Assignors: SOERENS, DAVE ALLEN, SHANNON, THOMAS G.
wherein R 1, R1′, R1″ are independently H or a C1-4alkyl, Z is any bridging radical whose purpose is to incorporate the R0 moiety into the ethylenically unsaturated monomer, and R0 is any group capable of or containing a constituent capable of forming covalent, ionic and/or hydrogen bonds with cellulose or with the polymer itself. R2′ and R2″ are any suitable polyoxyethylene endgroups including but not limited to H, alkyl, aryl, alkyl esters, alkyl amides, sulfonates and substituted derivatives thereof. p is an integer greater than or equal to about 350 and m and n are integers such that m+n=p. Examples of suitable Z groups include but are not limited to —O—, —S—, —OOC—, —COO—, —HNOC—, and —CONH. Suitable R0 functional groups include H, amine, amide, carboxyl, hydroxyl, aldehyde, epoxy, silanol and azetidinium groups. The materials may incorporate a second ethylenically unsaturated monomer whose purpose is to provide a charge or basis for charge development within the polymer. The charge is preferably cationic but may be anionic or amphoteric. Incorporation of such charge now makes the material substantive to cellulose in a wet end application. wherein R 2′, R2″, R1, R1′, R1″, m, n and p are as previously defined. wherein R 1, R1′, R1″, R2′, R2″, m and n are as described above. TEA(J/m 2) is the total-energy-absorbed in the dry state at maximum load during the tensile strength test. Elastic Modulus (Maximum Slope) E(kg f) is the elastic modulus determined in the dry state and is expressed in units of kilograms of force. Tappi conditioned samples with a width of 3 inches are placed in tensile tester jaws with a gauge length (span between jaws) of 2 inches. The jaws move apart at a crosshead speed of 25.4 cm/min and the slope is taken as the least squares fit of the data between stress values of 50 grams of force and 100 grams of force, or the least squares fit of the data between stress values of 100 grams of force and 200 grams of force, whichever is greater. If the sample is too weak to sustain a stress of at least 200 grams of force without failure, an additional ply is repeatedly added until the multi-ply sample can withstand at least 200 grams of force without failure. 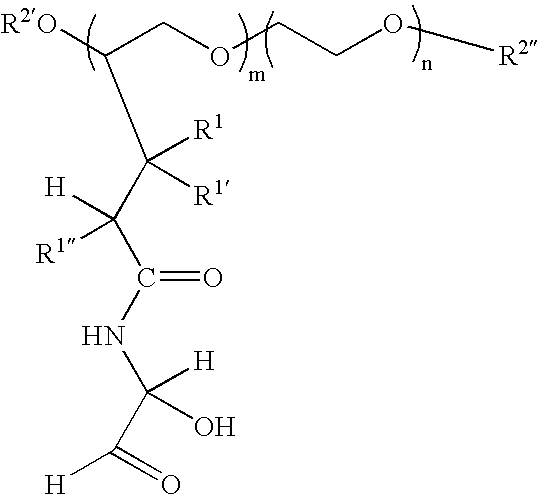 a fibrous web containing cellulosic fibers, the fibrous web being treated with a strength agent comprising a derivatized polyethylene oxide, the strength agent being present in an amount sufficient to increase the tensile strength of the fibrous web. 2. A paper product as defined in claim 1, wherein the fibrous web has a bulk density of at least 2 cc/g. 3. A paper product of claim 1 having a static coefficient of friction in the wet state no more than 10% greater than the static coefficient of friction in the dry state. 4. A paper product of claim 1 having a kinetic coefficient of friction in the wet state no more than 20% greater than the kinetic coefficient of friction in the wet state. 6. 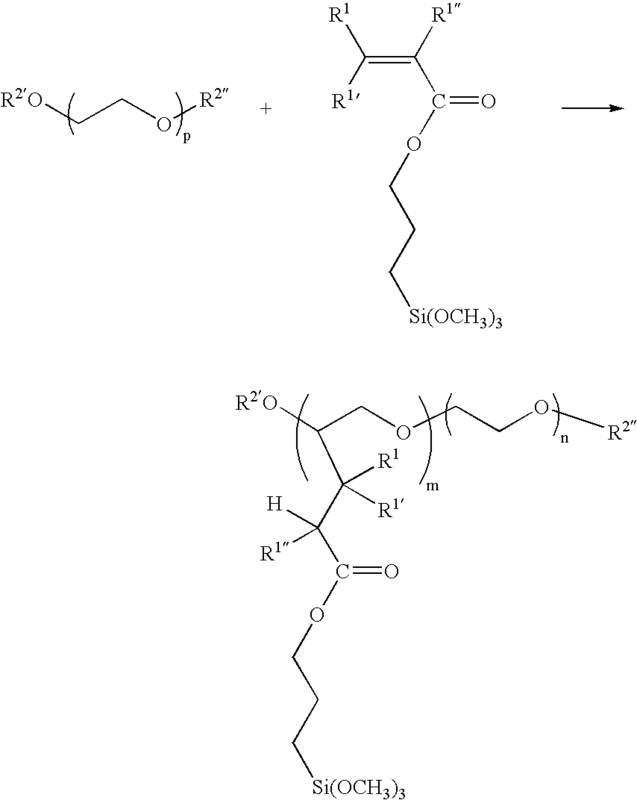 A paper product of claim 5, wherein Z is selected from the group comprising —O—, —S—, —OOC—, —COO—, —NHCO—, —CONH and mixtures thereof and R0 is selected from the group comprising hydrogen, amine, amide, carboxyl, hydroxyl, aldehyde, epoxy, silanol, azetidinium and mixtures thereof. 7. 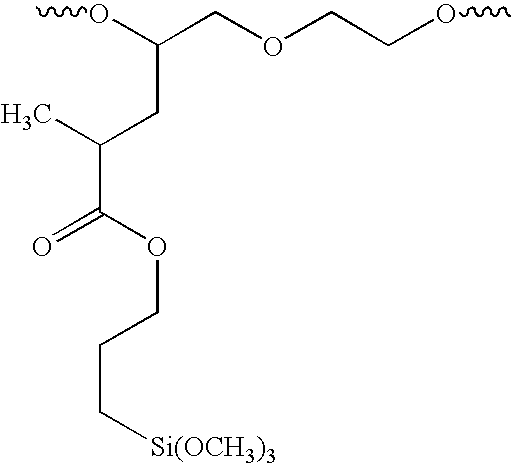 A paper product as defined in claim 1, wherein the derivatized polyethylene oxide comprises a silanol derivatized polyethylene oxide. 9. A paper product as defined in claim 1, wherein the polyethylene oxide contained in the derivatized polyethylene oxide has a molecular weight of at least 20,000. 10. A paper product as defined in claim 1, wherein the paper product comprises a facial tissue, a bath tissue, or a paper towel. 11. A paper product as defined in claim 1, wherein the derivatized polyethylene oxide contains derivative groups in an amount from about 0.5% to about 25% by weight. 12. A paper product as defined in claim 1, wherein the cross-linked and derivatized polyethylene oxide is present in the fibrous web in an amount from about 0.05% to about 10% by weight of fibers contained in the fibrous web. 13. A paper product as defined in claim 1, wherein the derivatized polyethylene oxide has been applied topically to at least one surface of the fibrous web. 14. A paper product as defined in claim 1, wherein the derivatized polyethylene oxide is cationic. 15. A paper product as defined in claim 13, wherein the derivatized polyethylene has been applied to both sides of the fibrous web. 16. A paper product as defined in claim 1, wherein the derivatized polyethylene oxide comprises a polyethylene oxide that has been grafted with an acrylamide or a methacrylamide followed by glyoxylation. 18. 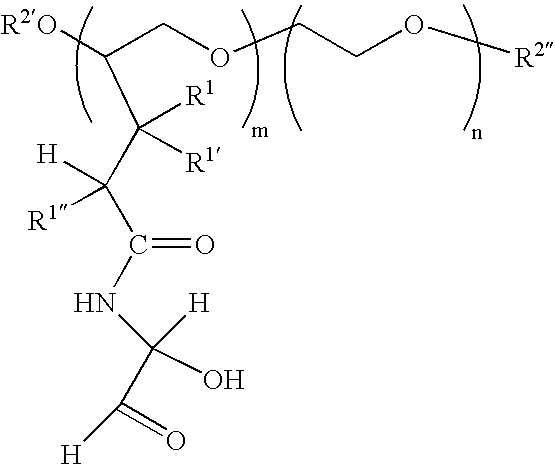 A paper product as defined in claim 1, wherein the fibrous web does not contain an epichlorohydrin derived wet strength resin. 19. A paper product as defined in claim 1, wherein the fibrous web further comprises a debonder. 21. 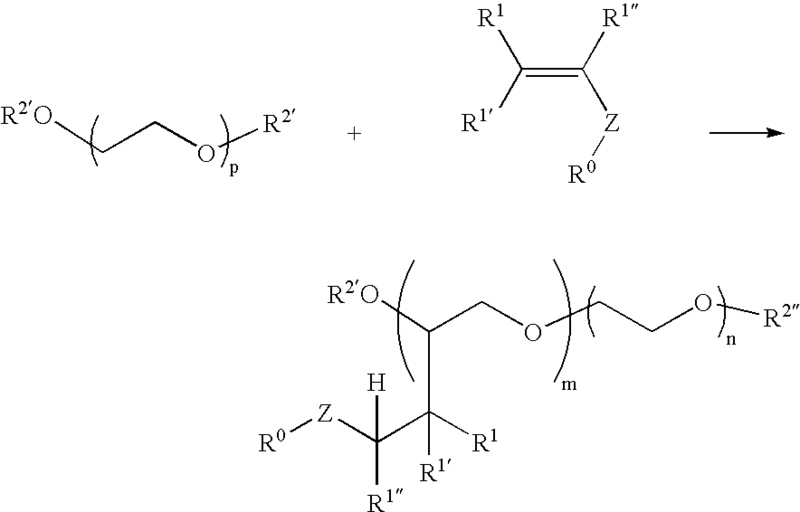 A paper product of claim 20, wherein Z is selected from the group comprising —O—, —S—, —OOC—, —COO—, —NHCO—, —CONH and mixtures thereof and R0 is selected from the group comprising hydrogen, amine, amide, carboxyl, hydroxyl, aldehyde, epoxy, silanol, azetidinium and mixtures thereof. 22. A paper product of claim 20 having a static coefficient of friction in the wet state no more than 10% greater than the static coefficient of friction in the dry state. 23. A paper product of claim 20 having a kinetic coefficient of friction in the wet state no more than 20% greater than the kinetic coefficient of friction in the wet state. 24. A paper product as defined in claim 20, wherein the derivatized polyethylene oxide comprises a silanol derivatized polyethylene oxide. 26. A paper product as defined in claim 20, wherein the polyethylene oxide contained in the derivatized polyethylene oxide has a molecular weight of at least 20,000. 27. A paper product as defined in claim 20, wherein the polyethylene oxide contained in the derivatized polyethylene oxide has a molecular weight of at least 100,000. 28. A paper product as defined in claim 20, wherein the derivatized polyethylene oxide comprises a polyethylene oxide that has been grafted with an acrylamide or a methacrylamide followed by glyoxylation. 30. A paper product as defined in claim 20, wherein the paper product comprises a facial tissue, a bath tissue, or a paper towel. 31. A paper product as defined in claim 20, wherein the derivatized polyethylene oxide contains derivative groups in an amount from about 0.5% to about 25% by weight. 32. A paper product as defined in claim 20, wherein the derivatized polyethylene oxide is present in the fibrous web in an amount from about 0.05% to about 10% by weight of fibers contained in the fibrous web. 33. A paper product as defined in claim 20, wherein the derivatized polyethylene oxide is cationic. 34. A paper product as defined in claim 20, wherein the fibrous web does not contain an epichlorohydrin resin. 35. A paper product as defined in claim 20, wherein the fibrous web further comprises a debonder. 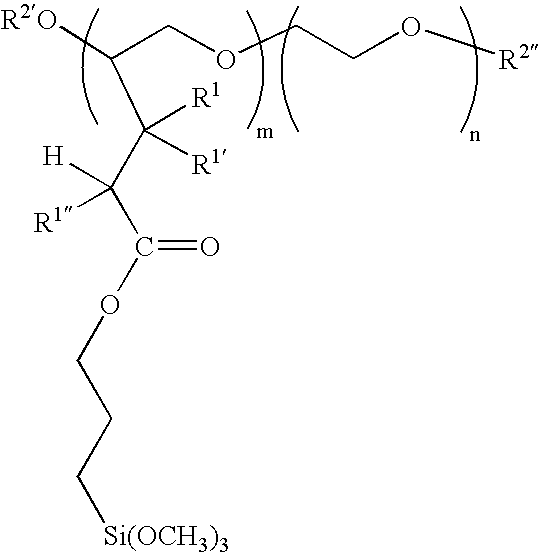 treating the fibrous web with a derivatized polyethylene oxide, the derivatized polyethylene oxide being present in an amount sufficient to increase the tensile strength of the fibrous web. 38. The paper product of claim 37, wherein Z is selected from the group comprising —O—, —S—, —OOC—, —COO—, —NHCO—, —CONH and mixtures thereof and R0 is selected from the group comprising hydrogen, amine, amide, carboxyl, hydroxyl, aldehyde, epoxy, silanol, azetidinium and mixtures thereof. 39. A process as defined in claim 36, wherein the derivatized polyethylene oxide comprises a silanol derivatized polyethylene oxide. 41. A process as defined in claim 36, wherein the derivatized polyethylene oxide comprises a glyoxylated derivatized polyethylene oxide. 42. A paper product as defined in claim 36, wherein the derivatized polyethylene oxide comprises a polyethylene oxide that has been grafted with an acrylamide or a methacrylamide followed by glyoxylation. 44. A process as defined in claim 36, wherein the derivatized polyethylene oxide is present in the fibrous web in an amount from about 0.5% to about 10% by weight of fibers present in the web. 45. A process as defined in claim 36, wherein the fibrous web is treated with the derivatized polyethylene oxide by combining an aqueous slurry containing the pulp fibers with the derivatized polyethylene oxide and then forming the aqueous slurry of fibers into the fibrous web. 46. 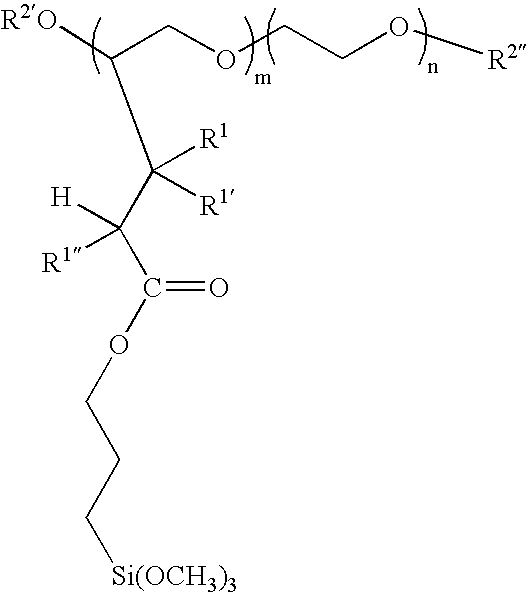 A process as defined in claim 36, wherein the fibrous web is treated with the derivatized polyethylene oxide by topically applying the derivatized polyethylene oxide to the web. 47. 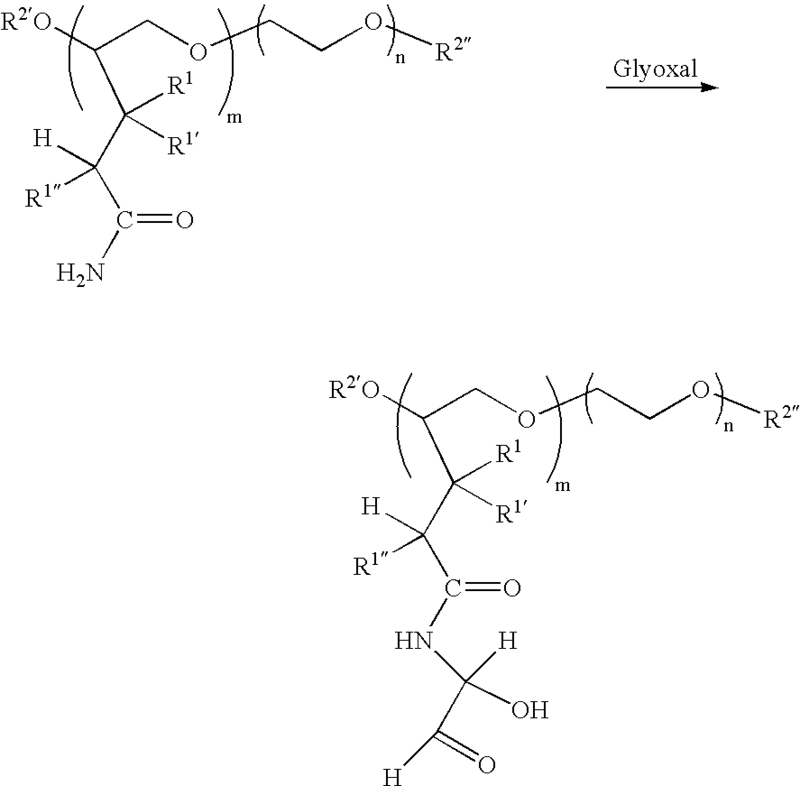 A process as defined in claim 36, wherein the fibrous web is treated with the derivatized polyethylene oxide without applying any epichlorohydrin resins. 53. The paper product of claim 52, wherein Z is selected from the group comprising —O—, —S—, —OOC—, —COO—, —NHCO—, —CONH and mixtures thereof and R0 is selected from the group comprising hydrogen, amine, amide, carboxyl, hydroxyl, aldehyde, epoxy, silanol, azetidinium and mixtures thereof.